These insulators are used when there is dead end of the line or corner or line is at a sharp curve or the line is crossing the river etc. these insulators reduce the excessive tension on the line under such abnormal conditions. For low voltage lines below 11 kV shackle insulators are used but for higher voltages strain insulators are used. Assembly of the suspension insulators is used as a strain insulator. The disc of the strain insulators are in a vertical plane instead of the horizontal plane as in the suspension insulators. In case of conditions like crossing of the river, there is excessive tension on the line. In such a case, two or more strings of the insulators are used in parallel. 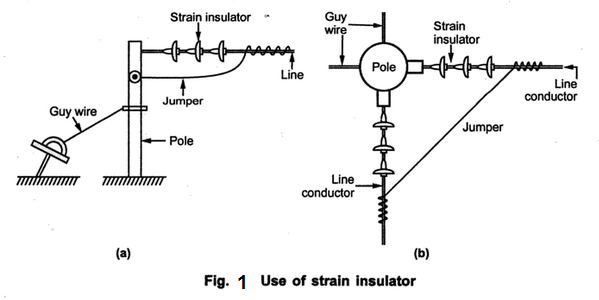 The Fig 1(a) shows the use of strain insulator. The Fig 1(b) shows the plan of the line.